Open the doors and a familiar interior awaits you. The dashboard is shared with the Jazz save for a few changes. The instrument cluster remains the same and so does the steering wheel. The centre console now gets an all-new 7-inch touchscreen that is shared with the City. It is an Android-based unit and supports WiFi, Bluetooth, USB and Aux-IN. It also gets GPS and a reverse camera. Sound quality from the new audio system is excellent and way better than the Jazz. Some other features include electric ORVMs, keyless entry, sunroof and automatic climate control. Cruise control and push button start are limited to the diesel trim only, surprisingly. The AC is a chiller and cools the cabin in a jiffy. Just like other Honda cars, the WR-V too misses out on rear parking sensors. The seats are shared with Jazz and they are very comfortable. The cushioning is soft and the seats feel nicely supportive even for well-built people. You also get a centre armrest at the front which is a useful addition. At the rear, you get abundant head room, knee room and shoulder space. What is disappointing is the fact that the WR-V neither gets Magic Seats nor does it get 60:40 split rear seats. The boot is decently sized at 363-litres. Another negative point about the interiors is the build quality on certain panels which feels very plasticky. Even the door pads have a slightly flimsy feel to them. Talking about the upholstery, Honda is offering two colour options – Black and Grey or Black and Blue.
. Moving on to the other end of the car, Honda has retained its familiar petrol and diesel engines, with 5-speed and 6-speed manual gearbox options. Starting off with what’s bound to be more popular of the two, the diesel-powered model gets a 1498cc, 4-cylinder turbo unit which makes 100bhp and 200Nm of torque. 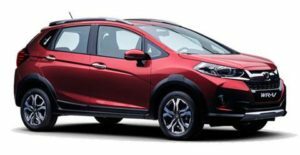 For the WR-V, Honda says they have worked on reducing the overall NVH levels. So has it worked? Not entirely. Although there’s less engine noise inside the cabin compared to the Jazz, the WR-V is not as refined as any of its rivals and the diesel clatter is evident nearly all the time. Honda, though, fights back with a fairly linear power delivery despite the strong mid-range punch. Better still, the 6-speed manual gearbox is a joy to use – it allows for super slick shifts and is complemented by a perfectly weighted clutch pedal.